Kwansan Cherry trees are glorious in flower and has been planted along with Yoshino Cherry in Washington, D.C., for the annual Cherry Blossom Festival. It has good yellow fall color, does not bear fruit, but is troubled with pests. These plants can be considered either tall shrubs or short trees. At maturity they are usually about 25 feet in height and width. They tend to grow stiffly upright, their branches forming a vase shape. In five years they can be expected to be about 12 feet tall and about 8 feet wide. In ten years they may be 23 feet tall, and about 16 feet wide. 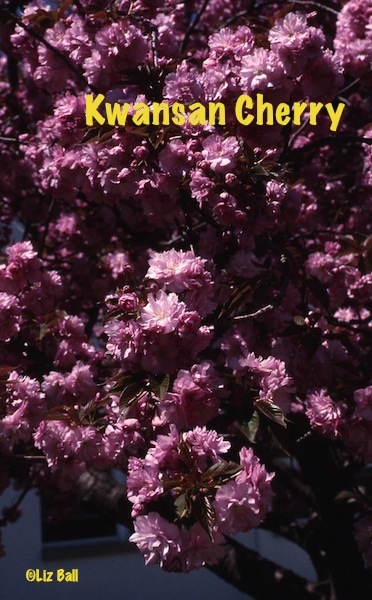 Kwansan cherry trees of all kinds are relatively short lived, their normal life span being about 20 years. Kwansan Cherry trees are deciduous, dropping their leaves in the fall. Usually their leaves are narrowly oval with pointed tips and toothed edges. About 3 inches long, they have prominent veins. They are light green in the spring, turning medium green over the growing season. Kwanzan foliage is reddish brown in the spring and then turns dark green. Many have a yellow or orange color some even turn purple, in the fall before they drop. Kwanzan sports drooping clusters of double flowers (30 petals) whose purple-pink contrasts with bronze spring foliage. Cultivars of this tree have many kinds of flowers. They emerge in early May. The flowers many be single or double, 3 to 5 in each cluster. In some varieties they are fragrant. They range in color from white to pale pink to deep pink. Typically flowers last about 10 days. Flower color varies with the cultivar but may be white, pink, or yellowish. Some cultivars have good fall color while others have useful growth habits. Amanogawa(Erecta) has semi-double, light pink, fragrant flowers, with a narrow columnar habit, growing to about 20 feet tall. Asano has double deep pink flowers with contrasting green-bronze leaves. Fugenzo(James H. Veitch, Kofugen) has a spreading habit, with double flowers 2.5 inches across, with colors rose pink fading to light pink. Kofugen is sometimes described as having deeper color. Hokusai has semi-double, pale pink flowers, is round topped and somewhat spreading. Imose boasts thick hanging clusters of mauve-pink flowers and copper colored spring foliage, but is difficult to find. Mt. Fuji has 2 inch fragrant white flowers, that are single or semi-double. Ojochin has single flowers that turn from pinkish-white to white. Shirofugen has a rapid growth rate, with young foliage being bronze and later turning to green. Its flowers are double, 2.5 inches across, colored pink fading to white. Shirotae(Mt. Fuji, Kojima) has flowers that are double to semi-double with white, ruffled blossoms, about 2.5 inches across. Shogetsu is a 15 foot tall tree , that is broad and flat-topped. Its flowers are double, pale pink, with a center that may be white. They can be two inches across. Ukon has young bronze foliage with pale yellow flowers that are semi-double.